ICC offers heavy duty hinged steel belt conveyors for applications requiring a steel belt due to the weight and bulkiness of the materials being conveyed. 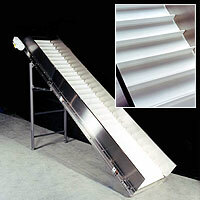 Manufactured in most industry standard pitches, hinged steel belt conveyors are available from stock 2 1/2 in. 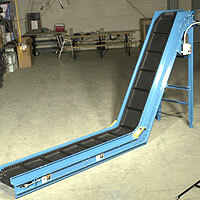 pitch conveyors to heavy duty 9 in. pitch custom designed structural steel conveyors. ICC steel belt conveyors are quality constructed to provide years of trouble free service in the toughest bulk material handling environments. Call ICC for quick quote and quick delivery. 2-1/2 in. Pitch Hinged Steel Belt Conveyors are ideal for applications handling steel chips, turnings, parts or stampings which typically require material to be removed from press or lathe type machinery into a scrap container. 4 in. 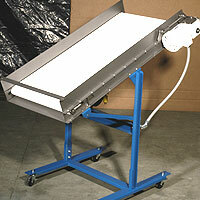 Pitch Hinged Steel Belt Conveyors are designed for heavier applications in which a belt pull up to 4,000 lbs. 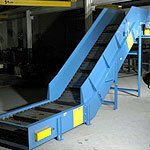 is required, but light enough that a formed steel conveyor frame can still be used. Ideal for feeding balers and shredders. 6 in. 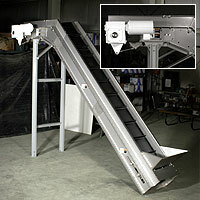 Pitch Hinged Steel Belt Conveyors are offered in two standard models. The SB600SA model is constructed of a 7 ga. formed frame. The SB600STC model is made of a structural steel frame which is typically used where loads from impact require a stronger frame structure. Both are available in multiple shape configurations. Designed for belt pull loads of up to 9,000 lbs. 9 in. 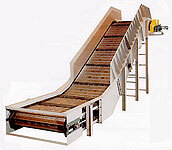 Pitch Hinged Steel Belt Conveyors are offered in a standard structural steel frame construction. Designed and built to last in tough bulk material handling applications with belt pull loads of up to 13,000 lbs. 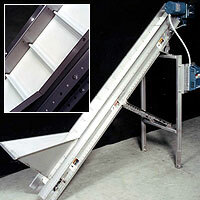 ICC offers standard lines of plastic belt conveyors designed for bulk material handling applications. Equipped with Intralox plastic belting in the 400, 800 and 900 series belts. Available in custom designs and stainless steel construction. 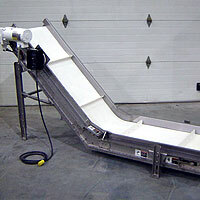 Our Model 107 plastic belt conveyors offer a 12 gauge, modular frame design for bulk and small parts handling applications. These units can accommodate live load capacities of 20-400 lbs. 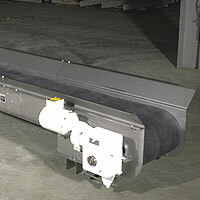 With the many styles and materials offered in the Intralox 900 series belting, these conveyors are designed to meet customer needs for a diverse range of applications. 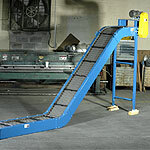 By using an ICC plastic belt conveyor, your customers can realize the value of their investment in the short term. Our Model 200 plastic belt conveyors boast a sturdy, 10 gauge, modular frame design for bulk and parts handling applications. By utilizing the Intralox 400 and 800 series belting, we can be confident in providing a style to fit your customers needs. Live load capacities range from 400 -1800 lbs. The model 200 plastic belt conveyor from ICC is designed to meet, or exceed, your customers expectations and can maximize their return on investment. 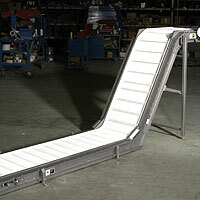 ICC offers a wide variety of standard and custom designed conveyors in stainless steel construction. Multiple options and packages are available to suit your bulk material handling requirements in washdown or corrosive environments. For applications requiring a more sanitary design, contact an ICC sales engineer today. The 300 series is an industry leader offering volume and capacity ratings using up to 2 inch high corrugated sidewalls with the convenience and versatility of a low profile frame. The 2 inch corrugated sidewall along with superior hold downs make this the ideal economical choice for handling powders, fines and product smaller than 1 inch in size. Options available for various levels of washdown, stainless and food handling requirements. Constructed of 12ga material. The 600 line offers the same superior holddown method and design of the corrugated sidewall belt as the 300 line but with added versatility to handle greater volume and capacity ratings. The corrugated sidewalls, superior holddowns and 10ga construction allow for cleaner conveyance of product that may normally cause excessive wear to hold downs and standard conveyor components. Options available for various levels of washdown, stainless and food handling requirements. Live load capacities up to 1000#'s maximum.